Karuta is a card game loved by the Japanese since olden times.The game is mainly played indoors by multiple players over the New Year holidays. Karuta is derived from the Portuguese word, carta, signifying letters or (playing) cards…Originally it was a word that represented all playing card games. Over the New Year, karuta (along with another traditional card game, Hyakunin Isshu) is a popular game enjoyed with family and relatives. The rules are very simple. Due to the images displayed on the cards, the game can be enjoyed by people of all ages, including children who cannot yet read. Over time children can accustom themselves to words and proverbs written on the karuta. 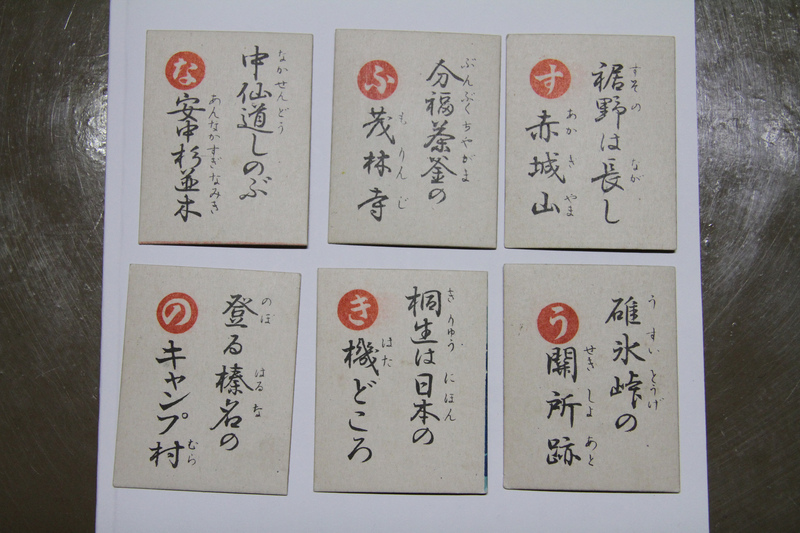 A more complex version of the karuta is a traditional card game called Hyakunin Isshu. 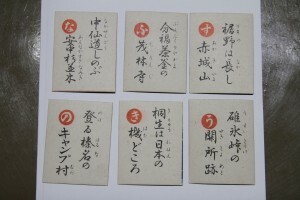 Hyakunin Isshu is advantageous to those who have memorized the poems and images on the playing cards. Karuta is much simpler, with one person reading off the label while the players look for the corresponding card. There are various types of karuta, the most common being one that utilizes the old alphabet,. called Iroha karuta.There are many other types, using proverbss, ancient poetry, art, or traditional songs. Various guesses are made as to the origin of the karuta. The first theory is a popular game among nobles that used clam shells. The shellfish are divided into males and females and the players used the designs on the shells to identify pairs. The game is similar to the game of Memory, played today. Eventually the nobles started to write two halves of poetry onto pairs of shellfish in order to identify pairs. This is said to be the start of one version of karuta. The other theory is that a version of today’s karuta game (referred to as Western karuta) was brought over by Portuguese missionaries. This influenced the nobles, who eventually abandoned clam shells in favor of playing cards. Karuta has been banned several times in history due to its use as a gambling tool. There must be several players to play the game of karuta: one reader and two players. The reader reads first half of the poem, and the player must identify and slap the card containing the second half. The card may be taken before the reader is finished reading, but if the wrong card is taken, the player must sit out one turn. The game is continued until all cards are taken. The game calls for memory, as well as quick reflexes.The game is fun to play with children, and useful in learning the alphabet and new words. Looking to purchase karuta? Visit Okuno karuta shop in Jimbocho, Tokyo. 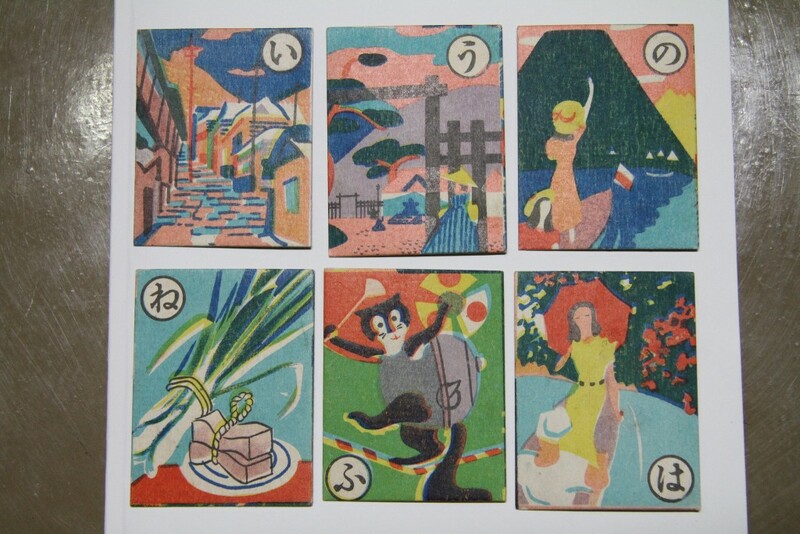 Various types of Japanese playing cards and other traditional games like sugoroku are sold in this quaint shop.